Your browser is not capable to show inline frames or does not show them with its current settings. The Wafer Profiler CVP21 is a handy tool to measure doping profiles in semiconductor layers by Electrochemical Capacitance Voltage Profiling (ECV-Profiling, CV-Profiling) in semiconductor research or production. This ECV Profiler (CV-Profiler, C-V-Profiler) furthermore is a very good choice to analyze or develop strategies for Photo-Electrochemical Wet Etching (PEC-Etching) of semiconductors. The comparison list shows that ECV-Profiling is a very valuable and handy SOLUTION to check the doping. to minimize space requirements in clean room. less commonly used semiconductors (please contact us for sample measurements). Stacked layers are no problem (the material, the doping and the doping type may vary). No Restrictions concerning the substrate (may be conductive or insulating). Sample size: 4*2 mm² to complete 8" wafer size are standard (smaller samples on request). Concentration resolution < 1012 cm-3 to > 1021 cm-3 (*). Depth resolution 1 nm to 100 µm (*). High Reliability system (special concern on electronics, mechanics, optics and fluid system). Calibration-free system (Complete self calibrating electronic system - no needs for cable capacitance calibration). Easy-to-use (Software optimized with full user management - easily used as well in production as in laboratory environment). 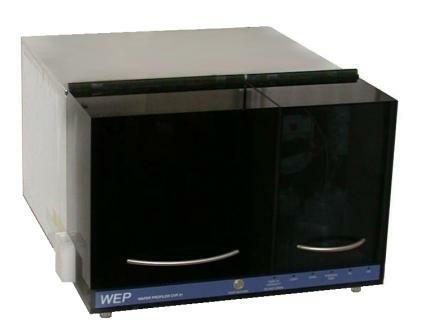 Wafer-Stepping (Complete wafer stepper is optionally available - to process several measurements on a wafer in full automation). Camera-Control (The process is controlled on-line by a color camera - after each measurement camera data is available in film strip format). Recipes (Measurement recipes are pre-defined and may easily modified by a user with higher priority). Dry-In / Dry-Out: Auto-Load / Unload / Reload (The loading/ un-loading and re-loading of the electrochemical cell is automated and may be easily modified by a user with higher priority. The samples are processed dry-in / dry-out). (not shown: PC with monitor and printer, and drain can for used electrolyte). or with a footprint of 60*80 cm to minimize space requirements in clean room. 230V(-15%/+10%), 50-60Hz, 500VA-1000VA (voltage 100V/110V optionally available). The benefit list compares our equipment CVP21 to other ECV equipment. Patents: DE-10256821, US-7026255 (furthers pending).